After continued delays in the publishing schedule DC Comics finally had to admit defeat. With no guarantee when Heinberg could finish the final part of his five issue story line, it was announced that the story would be wrapped up later in the year as part of a special Wonder Woman Annual. Instead, issue five would launch straight into a new story line by acclaimed New York Times best-selling author Jodi Picoult. Her story was tied in very closely with a four issue mini series starting in March called “Amazons Attack!“, in which the Amazons return intent on waging war against America. As a result, DC could not afford for her run to start out of sync, especially as Heinberg’s own incessant lateness had already undermined continuity in other books within the DC Universe. 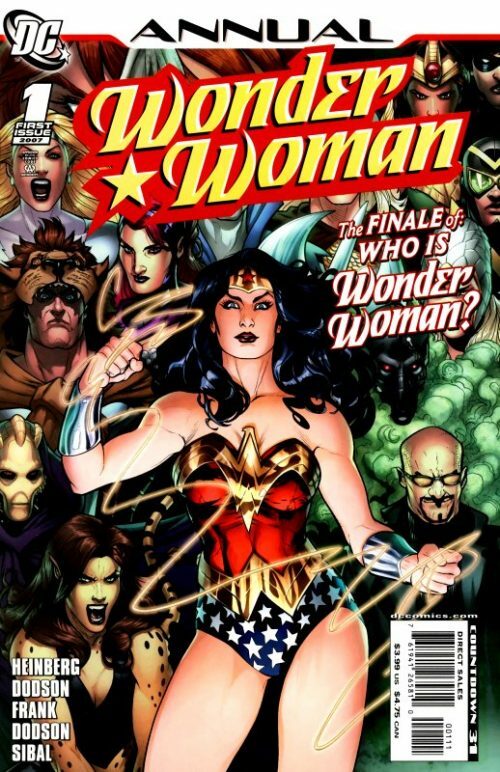 Originally, Heinberg had planned to tease fans with his “Who is Wonder Woman?” story line so that they were never really sure whether Diana would return to her rightful place as the Amazon Champion, or if instead Donna Troy would continue taking up the mantle. 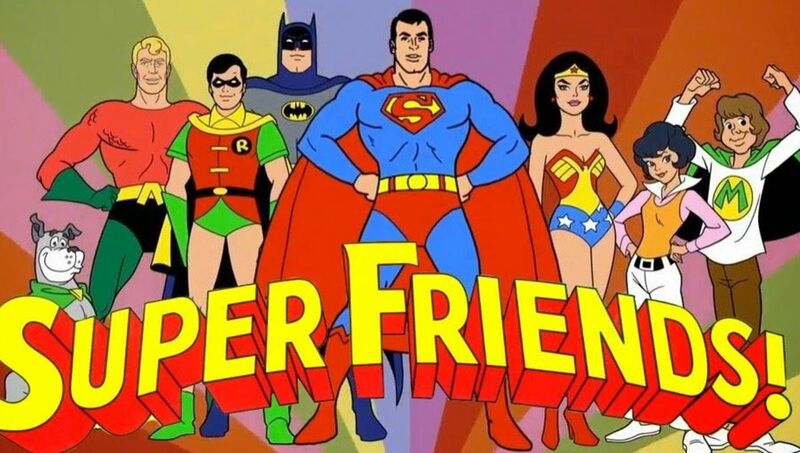 However, any suspense regarding the eventual outcome of this story was all but ruined within a couple of months as Diana made her appearance in the new “Justice League of America” book. Now fans knew exactly how things would work out and any clever plot devices Heinberg might have intended to use in order to draw out the uncertainty were all but made redundant! This issue finally reveals where Heinberg had been leading fans as he makes his case for why Diana is the true Wonder Woman, depicting her outsmarting her foes with tact and guile – and all without her much vaunted powers. Once again, the Dodsons provide some stunning art. 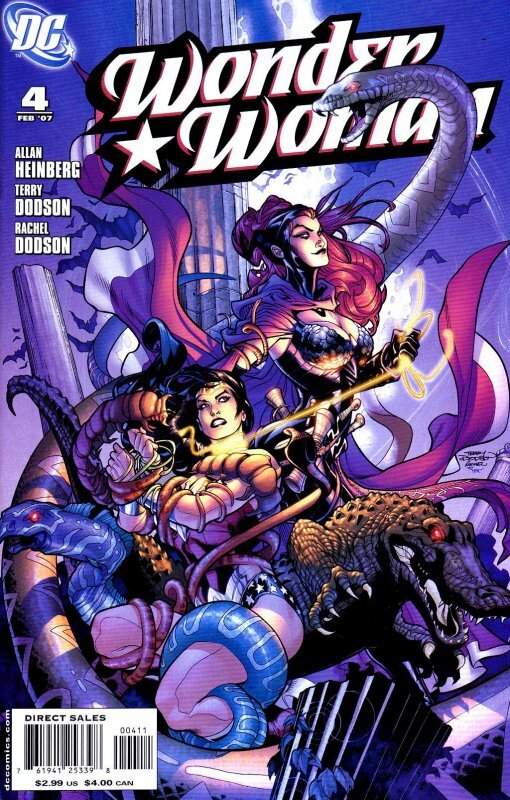 Of particular noteworthiness are a couple of splash pages – one depicting Diana performing the “Wonder” spin to transform into her costume and the final panel showing Diana confronted by her entire, revamped rogues gallery who are determined to take her down once and for all! Anyway, back to Jodi Picoult. Apart from the “Wonder Woman Annual” #2 back in 1989, which featured stories all written by female authors, and a one shot story by Trina Robbins called “Wonder Woman: The Once and Future Story” written in 1998 together with her four part “Legend of Wonder Woman” mini series that ran between the end of Volume One and the start of Volume Two, one of the most iconic heroines in the world had surprisingly never actually been written by a woman in her own regular book. 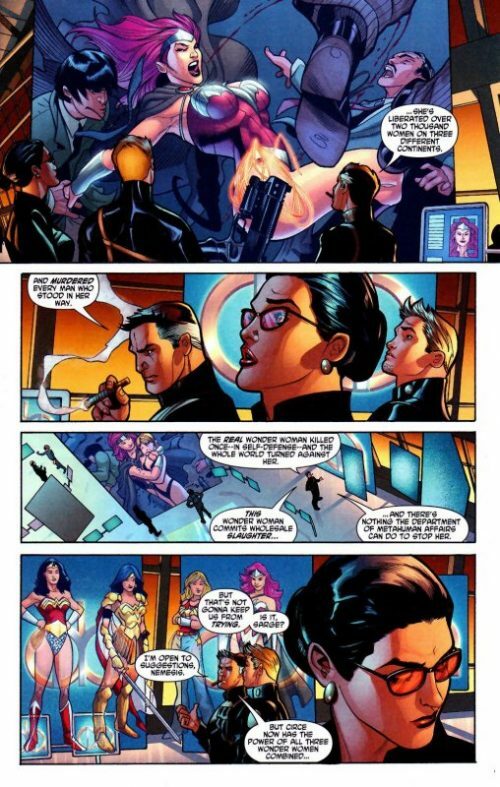 Back at the headquarters of the Department of Meta Human Affairs, Diana, Sarge Steel and Nemesis watch the news feeds showing Circe’s one woman crusade to free enslaved women everywhere as the new “Wonder Woman” – and in the process killing every man who stands in her way! The Government Agency is at a loss how to stop her and Diana returns to the Themysciran Museum to meet Cassie, Donna and some of her fellow JSA members to discuss tactics. Dr. Midnite confirms that all three Wonder Women have indeed had their powers stripped from them by Circe. A furious Cassie demands they make a full frontal assault but Diana urges caution. Cassie, still angry with the Amazon Princess for what she sees as having abandoned her responsibilities, storms out. Donna too says that she wants to try to take down Circe with the help of Dr. Fate and some of the other mystics, leaving Diana alone to contemplate her next move. Just then a humble Hercules arrives to apologise for his actions as he too no longer has any of his Godly powers. Diana tells him she is going to use the others’ attacks on Circe as a diversion while she makes an assault of her own and Hercules agrees to accompany her. Diana borrows a Wayne Tech stealth plane and flies them to Circe’s island home of Aeaea. She informs the demiGod that she intends to locate the witch’s Grimoire, the source of her spells, and hold it hostage until she returns the stolen powers. Armed only with a couple of tranquiliser guns and the herb moly, which offers protection against Circe’s spells, they make their way towards Circe’s castle. But Circe arrives having anticipated Diana’s plan and they find themselves under attack. 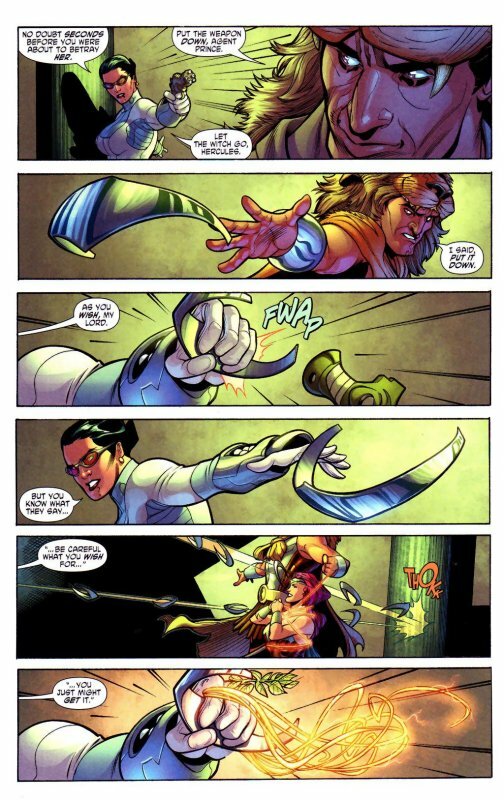 Circe tries to kill Hercules but Diana saves him and during the fight manages to gain possession of her magic lasso. She makes her way inside and finds the Grimoire. 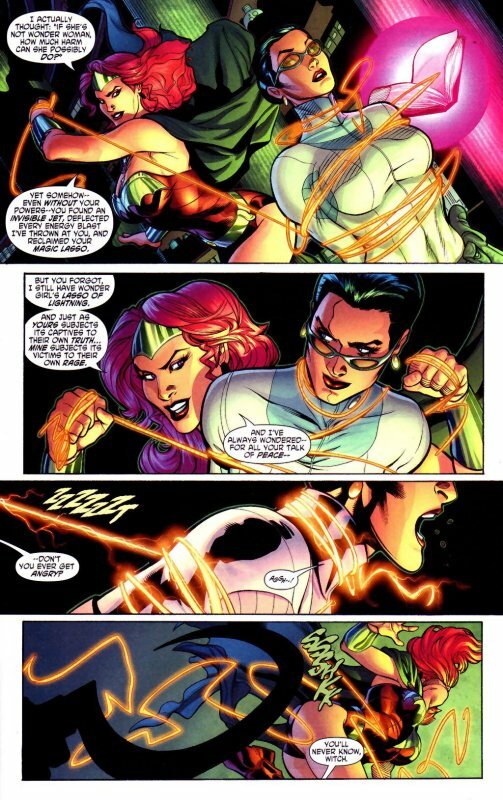 But Circe appears again and ensnares the Amazon Princess using the stolen lasso belonging to Wonder Girl. She tries to use its powers to make Diana feel total rage but is stopped short by Hercules, who knocks the witch out and picks up the lasso, attaching it to his own belt. Diana then binds Circe using her own lasso and thanks Hercules for his assistance. But the demiGod has tricked her and suddenly lashes out, sending her flying across the room. As she wipes a trickle of blood away from the corner of her mouth he explains that he and Circe had been working together all along. When Athena had decided to withdraw Olympus from the Earthly plane, he had not agreed with the decision. An angry Hercules had gone to the Underworld to see if he could persuade Ares to join him and stop Athena, but instead had found Circe there. Together they had agreed to stay behind on Earth and make it their own, but the witch had betrayed him by stealing his powers – albeit before he had had the opportunity to betray her first! Now he intends to make Circe transfer all her powers over to him! The listening Diana points her gun at him and he casually throws his metal head piece to disarm her. But this is what the wily Amazon Princess wants him to do and catching the head piece, she swiftly throws it back. It ricochets off the back wall and ensnares the lasso on his belt as it makes it way back to her waiting hand. Diana expertly catches them both and uses Cassie’s golden rope to encircle Hercules. She orders him to free Circe or face the fury of his own rage! He holds his deadly scythe against Circe’s neck and warns the Amazon to release him or else the witch dies. “And the power of the Gods with her” Diana reminds him. Undeterred, the demiGod instructs the still bound Circe to utter the words of the transfer spell. Diana tells Circe not to fight the command and that “this time…the truth shall set you free”. The irony of the situation is not lost on the Amazon Princess. Her mission to Man’s World had ended when, in order to save the lives of millions, she had taken the life of one man. Now, to save the life of her sworn enemy, it seems she must prove that although Diana is no longer the God’s Champion…nor the Amazon’s Ambassador…she is till worthy of the name “Wonder Woman“!. Circe, compelled by the lasso wrapped around her, is forced to obey but tells the unsuspecting Hercules that in order for her to cast a new spell she must first reverse the old one. Before he can react she utters the spell and Diana’s powers are returned to her. In an instant the Amazon Amazon spins around and transforms into Wonder Woman! She smiles and tells Hercules and Circe that their reign as Gods over Earth is over. But just then she hears the words “..but ours is only just beginning!” and turns to see her entire rogues gallery, all with their revamped and enhanced powers courtesy of Circe, surrounding her!!! The true Wonder Woman has at last revealed herself…but will she live to tell the tale?